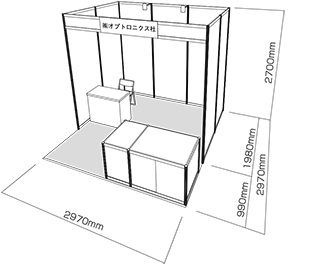 * Booths are partitioned by panel boards of W2.0m x H2.7m to the left & right of neighboring booths. * The back panel is W3.0m x H2.7m in size. The floor is carpeted and is grey in color. * Additional components / features are available. * Any additional electrical work can only be carried out by the organizer, the cost of which will be sent to the exhibitor. * Please bear in mind electrical running costs. * There are no carpet, display tables or fixtures. 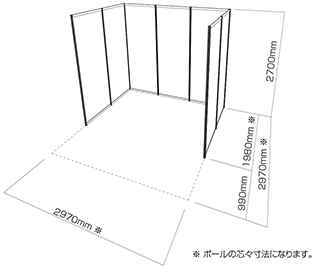 However, the walls will be set by the organizer. 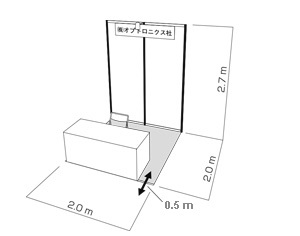 * As shown in the figure, we changed the size of the table to secure the doorway. * Optional set is available.